Neil Gorsuch, Trump’s bad tweets, and how to save the Democratic Party, in the Slate Plus Digest. The Slate Plus Digest for June 30. 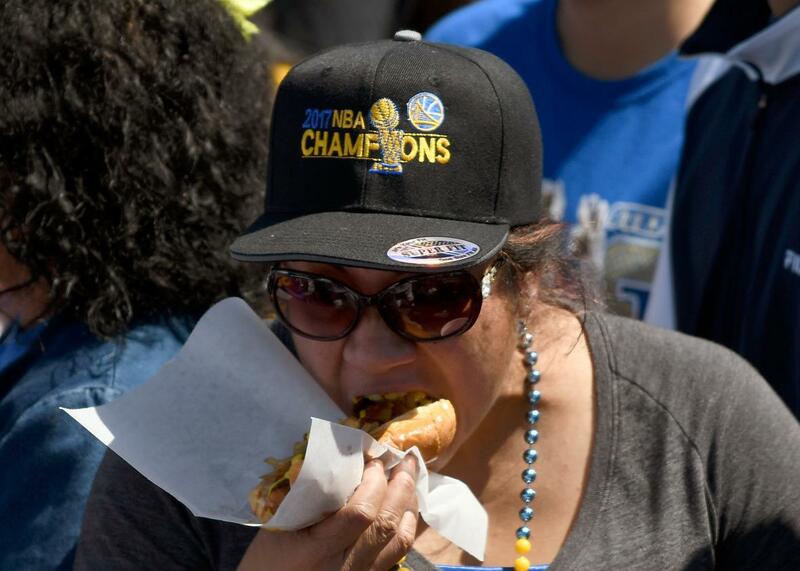 A Warriors fan enjoys a hot dog. Hello Plus! Do the patriotic fripperies of Independence Day feel a little off this year, or is it just me? Is this a time—now more than ever!—to celebrate everything wonderful about the ideal of America: its openness, its pluralism, its … God, I’m having a hard time even remembering how the cliché goes at this point. America! It’s a big country with a lot of economic activity, and it has certainly made some significant contributions to world history, and also to popular music and sports. Happy Fourth. Here are some things to read. Donald Trump has been mostly keeping his misogyny in check since his inauguration, Michelle Goldberg writes, but the mask slipped with his tweets about Mika Brzezinski this week. Better for the president to show us who he really is, Goldberg argues. How can we save the Democratic Party, which is locked out of power at almost every level of government? Seven smart, terrified liberals discuss. The self-importance of the response to this piece is the best validation the piece could hope for. If the Senate’s Better Care Reconciliation Act becomes law, “thousands of Americans will probably die needlessly every year,” writes Harold Pollack—even though advocates of the bill would have us believe it’s impolite to say so. More and more American women are dying in childbirth. The good news is that when California decided to take the problem seriously it was able to bring the death rate down to a third the national average. The bad news is that the rest of the country doesn’t really care. I was skeptical of this argument about a character from the Harry Potter novels, but it’s weirdly plausible. In the New Yorker, Emma Rathbone takes us back to a bygone era … before the internet. Slate launched a new video series this week titled “Who’s Afraid of Aymann Ismail?” Every two weeks, Aymann explores Islam in America, and American fears about Islam, with his characteristic openness, bravery, and good humor. It’s a remarkable thing. You can see the first two episodes—the first about homophobia in the Muslim community, the second about the practice of Ramadan—on Slate or on the show’s Facebook page. Aymann! In the first episode, we meet your cousin Mo—a gay Muslim man who was disowned by his parents when he came out of the closet. What did he say when you asked him to talk on camera? Aymann Ismail: I was nervous about asking him! We weren’t very close before he came out. But when I suggested it, he immediately wanted to do it. He’s talked to a lot of other gay Muslims and they all say that when they’re in the closet and wondering what to do, they can’t see anyone living as an openly gay Muslim, and it’s incredibly isolating. So he wanted to do something about that—to put himself out there and say, “I exist.” It was great working on the episode with him. Now we talk every day. Thanks, Aymann, and congratulations on the series. And thank you for your Slate Plus membership. We’ll see you next week.